Does anyone recognize this pattern? My grandmother began these years ago before she developed Alzheimer’s. She asked me to please finish this as a tablecloth if she wasn’t able to complete it. I want to honor my grandmother’s wish, but the pattern was not left with the squares. Please help!!! This looks like it might be it. Well done, Bgs! You posted as I was typing a reply, that does indeed look like it, or awfully close. I'll just leave part of it here as food for thought. I like to make thread things but have never attempted a whole tablecloth or bedspread. For one thing, it quite literally can take MILES of thread, and is quite a huge project that can take months or even years. When my paternal grandmother passed away (over 40 yrs ago), my Dad cleaned out her house and brought back a few crochet things of hers. 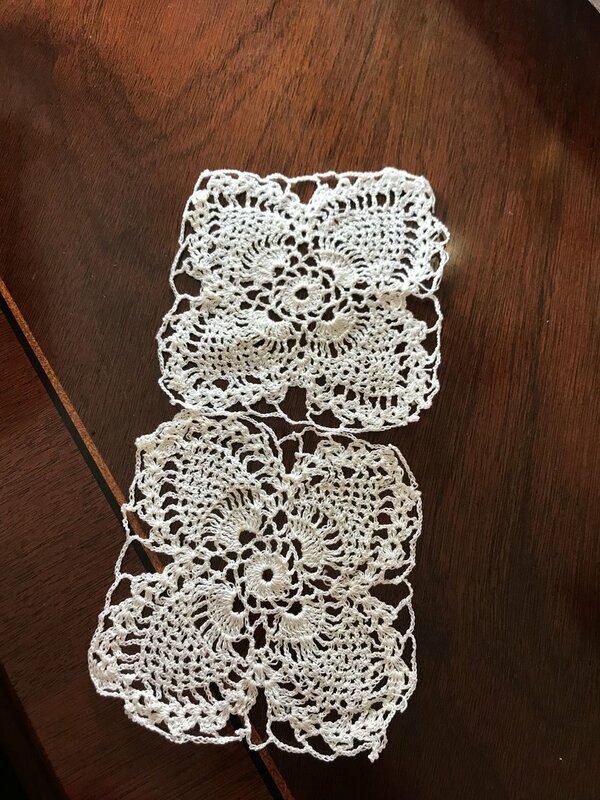 One was a few thread motifs and a couple of (tiny) balls of matching ecru thread; my Dad remembered that she was working on this when he came back from WWII. And no pattern. I was in college and had only been crocheting a few years. Long story short, I only had a little bit of 50 year old ecru colored thread, and a few motifs, so no way I'd find matching thread. I ended up reverse engineering the pattern, adding a couple of my own motifs to hers and ended up with a table centerpiece sized doily (they were hexagonal, and the motif looked like flower petals, so something round made sense). 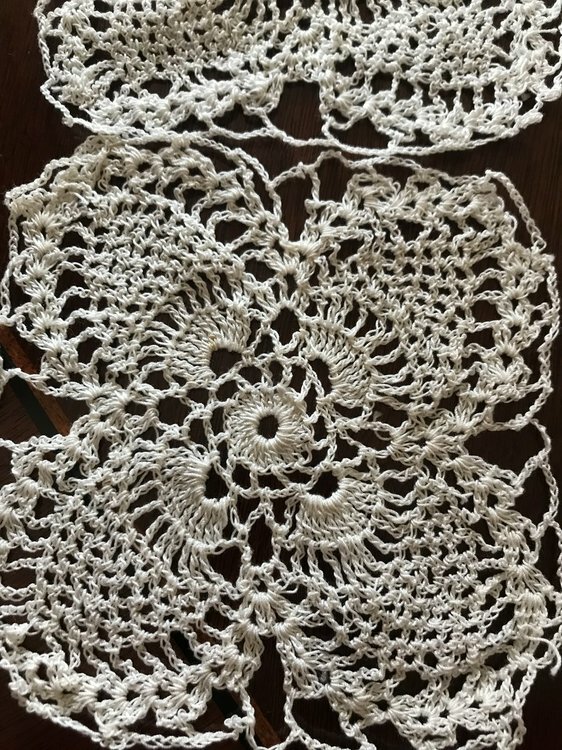 If you only have 2 motifs, I'd suggest thinking along those lines, perhaps make a table runner to honor your Grandmother's wishes? I like the table runner idea. If you happened to have lots of squares you could share grandma's work with other relative's by making them one too. As Granny Square said its just a thought. Thanks everyone, I appreciate the help and the ideas. Hi ﻿﻿and Welcome to Crochetville from ﻿the Gulf Coast of Florida. Wow you two are fast. I was just going to post both of them.